Astrology as a branch of science is quite mature, while many of the Astrologers are not!! Sign is inanimate, sign represents field of experience while Planet represents consciousness. Each sign is associated with an element: Fire, Earth, Air or water and signs are classified as “Chara”, “Sthira”, “Dwiswabhava” meaning Moveable, Fixed and Dual nature respectively. Lagna is very important sign to understand, as it represents you. Lagna is the sign which is rising in the eastern horizon at the time of birth. Lagna takes 1 full day to go around the zodiac (due to earth’s rotation) and come back to the same point. So Lagna stays in a sign for 2 hours. 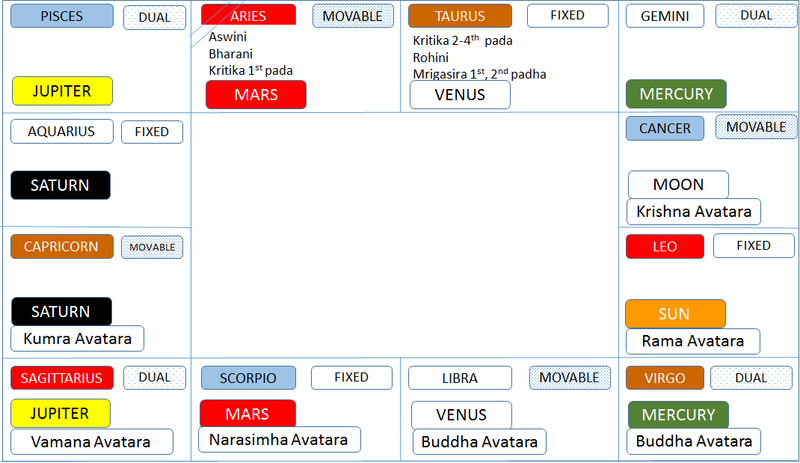 Position of 9 planets in their respective positions at the time of birth constitutes the Rasi chart for you. Moon takes about 29 days to go round the zodiac, Sun takes about 365 days, Me and Ve about 1 year, Mars takes about 1.5 years, Jupiter about 12 years while Saturn takes about 30 years. Rahu and Ketu take about 18 years, they go around in the reverse direction. 9 planets are Sun (Surya or Ravi), Moon (Chandra), Mercury (Budha), Venus (Sukra), Jupiter (Guru), Mars (Kuja or Mangala), Saturn (Sani), Rahu and Ketu. One of the prominent things in Hindu Astrology is the importance of Rahu and Ketu, physically not existent, but treated as a full-fledged Planet. Among the planets Jupiter, Venus , waxing Moon are classified as natural benefics (Saumya Graha) while Sun, Saturn, Mars , decreasing Moon, Rahu and Ketu are classified as Natural malefics (Krura graha, literally meaning cruel not necessarily malefic). Mercury is a natural benefic if alone, if it is in conjunction with a malefic planet, Mercury becomes malefic as well. Although Planets are physical bodies revolving around the Sun, they are also within us in a microcosmic form. Each planet represents a specific quality within us. Sun represents the Soul, Sun is the universal soul. Moon represents the mind, Mercury represents the learning ability, Venus represents the enjoyment. Venus is a rajasik planet and is teacher of daemons, it keeps daemons under control. Mars is the commander-in-chief and represents aggression and drive, and pushes for immediate results. Jupiter is the teacher of Gods and represents wisdom and intelligence within us. Saturn represents discipline and hard work, Saturn is a slow moving planet, go slow but completion for sure is the quality. Each Planet has a ruling period in a person’s life span and it is important not to get carried away with typical astrologer’s statements of sade-sati (or) 7 1/2 year period of Saturn transit. The effects of each planet needs to be determined by the position of Planets in a person’s chart and not to be generalized. In the natural zodiac Saturn represents 9th and 10th house (picture shown below, start clockwise from Aries), they represent karma and fruits respectively. Yes, in the natural process of separation, of the new replacing the Old, Saturn does undertake certain specifics but that should not be classified as evil-always. People like Jawaharlal Nehru and Modi got into PM position during this period. Abhijit Nakshatra is not counted among the 27 but is used for Muhurtha considerations. Each Rasi extends 30 degrees in the zodiac, each Star spans 13’20”. Each star is divided into 4 padas of 3’20” each. So in each sign we have 2 stars completely and 1st pada of 3rd star. Thus 2 1/4 constellations or 9 quarters comprise a zodiacal sign. The constellation in which Moon is posited at the time of Birth is the birth star of the person. © 2019 BeyondSenses. All rights reserved.